(A) . What are Plastics? (C) Why Plastics? - Importance of Plastics in Modern Society. Plastics are macromolecules, formed by Polymerization and having the ability to be shaped by the application of reasonable amount of heat and pressure or some other form of force. Polymerization is the process by which individual units of similar or different molecules ("mers") combine together by chemical reactions to form large or macromolecules in the form of long chain structures, having altogether different properties than those of starting molecules ("mers"). Several hundreds, and even thousands of "mers" combine together to form the macromolecules, or what we call, Polymers. Depending upon their nature and properties, the polymers are classified as Plastics, Rubbers or Elastomers and Fibres. If the polymer chains are very flexible, the inter molecular forces of attraction low and the chains do not fit to a regular lattice structure easily, the material will tend to retract upon when external tension is released. This is the state typical for a Rubber or Elastomer. In the other extreme, if the polymer chains are inherently rigid, the intermolecular forces intense and the molecules fit readily into a crystal lattice, then the crystallinity once induced, will tend to be permanent. Such a material would be a typical Fibre. In the intermediate case, when the intermolecular forces of attractions are neither too high nor too low, the polymer is called Plastic. Generally speaking, a plastic material should posses sufficient rigidity, dimensional stability and mechanical strength at room temperature to serve as a useful household article, gadget or structural part and still be of such a character that it may be molded to shape by the application of reasonable temperature and pressure. There are no intrinsic differences among Rubbers, Plastics and Fibres. Any apparent difference is a matter of degree. Natural Polymers and Synthetic Polymers. 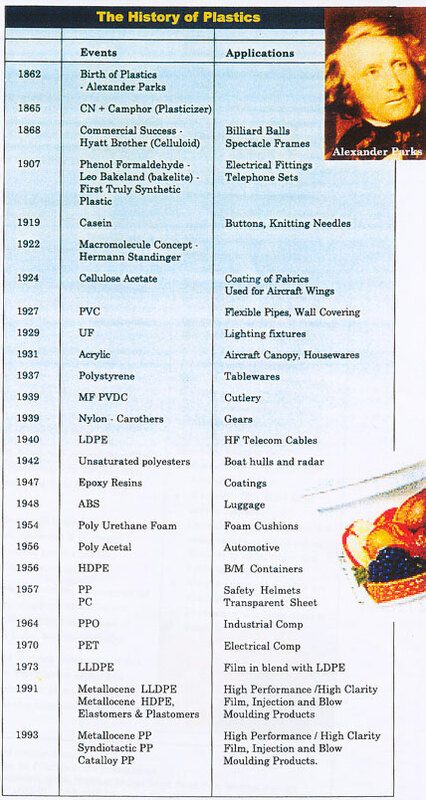 Examples of Natural Polymer: Starch, Natural Rubber, Gelatin, Protein, Shellac, Cellulose etc. Polyethylenes - Low Density Polyethylene, High Density polyethylene, Linear Low Density Polyethylene, Polypropylene, Polystyrene, Styrene Butadiene Rubber(SBR), Nylon etc. In Organic Polymers, the main constituent is Carbon Atom along with any one or more of the following constituents: Hydrogen, Oxygen, Nitrogen, Halogens etc. Examples : Polyethylene, Polyvinyl Chloride, Nylon etc. In inorganic Polymers the main constituents are other than carbon, like Silicon, Boron etc. Examples : Polysilanes, Polysiloxanes etc. Thermoplastics are those, which once shaped or formed, can be softened by the application of heat and can be reshaped repeatedly, till it looses its property. 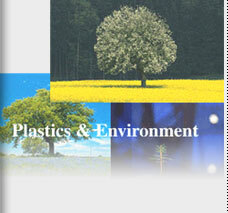 Example: Polyethylene, Polypropylene, Nylon , Polycarbonate etc. Applications are : Polyethylene Buckets, Polystyrene Cups, Nylon ropes etc. Thermosetting Plastics are those, which once shaped or formed, cannot be softened by the application of heat. Excess heat will char the material. Example : Phenol formaldehyde, Urea Formaldehyde, Melamine Formaldehyde, Thermosetting Polyester etc. Applications are - Backelite Electrical switches, formica / sermica table tops, melamine Cutlery etc. These chemicals are intern derived from Natha obtained during petroleum refining process or from Natural Gas,after procesing. Plastic have moulded the modern world and transformed the quality of life. There is no human activity where plastics do not play a key role from clothing to shelter, from transportation to communication and from entertainment to health care. Plastics, because of its many attractive properties, such as lightweight, high strength and ease of processing, meet a large share of the materials needs of man, and that too at a comparatively lesser cost and causing lesser environmental implications. From practically zero during the beginning of the 20th century, human kind today consumes more than 150 million tons of plastics per year. Plastics possess a unique combination of properties. Plastics can be super tough, rigid as well as flexible, transparent as well as opaque and can allow permeation or act as a barrier material. Growing population and material consumption has put severe pressure on our natural resources and fragile eco-systems. The material needs of our population are growing and plastics offer a cost effective alternative. Plastics are employed in myriad applications where they actually conserve natural resources. For example, asceptic packaging of food in barrier packaging films will save refrigeration cost and saving capital and energy. Edible oils and milk are packaged in flexible packages eliminating the use of tin and glass containers. Rigid HDPE barrels are used for bulk chemical storage instead of steel drums. Apart from conserving natural resources, use of plastics in these applications saves transportation fuel as plastics are substantially lighter than tin, glass or steel. Safe drinking water in PET bottles is a very common sight now-a-days. They provide confidence to consumer on the quality of water and help reduce water-borne diseases. Advance polymeric membranes help purify water from viruses and bacteria. They also provide potable drinking water from sea and blackish water through a process of desalination. The fact that plastics are made from hydrocarbons derived from petroleum, which is non-renewable, has raised questions concerning its sustainability. Nevertheless, the consumption of petroleum hydrocarbon for the production of plastics is less than 5%, the balance being consumed as fuels and energy source. Consequently, the concerns about sustainability of plastic material is somewhat exaggerated. On the contrary, processing of many natural materials (glass, paper, wood, metals) consume far more energy and thus lead to greater consumption of fossil fuels. Additionally, research and development work currently in progress globally will provide future opportunities to make some of the plastics from biomass and other renewable sources. Thus, plastic manufacture will become even more sustainable in the years to come. It is fair to say that plastics replace several naturals, which are either scarce, consume more energy for processing or cause damage to the eco-system during their production. Thus use of plastics makes positive contribution to the sustainability of earths resources. The signature of all natural materials made by biological process is that they are biodegradable and bio-assimilable. The long life and desirability of plastics, which have made them, a material of choice for many applications is seemingly a disadvantage when it comes to their disposal. However, when handled properly, plastics do little damage to our environment. Plastics have the advantage that they can be easily reprocessed and recycled. Plastics offer the unique advantage that one can recover the fuel value contained in the hydrocarbon polymer after its use. Plastics can also be made environmentally degradable, especially for packaging applications. There are expectations that in the near future plastics will be made even biodegradable and compostable so that waste plastics can be handled the same way as wet food waste and agricultural waste. The overall eco-friendliness of plastics becomes apparent when one evaluates the total "life cycle", namely, an analysis of raw materials, energy, effluents, methods of disposal etc. of a material from its origin to its final disposal. In 1862, Alexander parkes in Britain modified cellulose nitrate with camphor to produce the first man made plastic material - Celluloid.